The Dinkels of Wasilla are known for their vegetables. They’re regular vendors at farmers markets around Anchorage and the Valley, and two of them have won the Giant Cabbage Weigh-Off at the Alaska State Fair. They’ve also raised a nice crop of basketball referees. 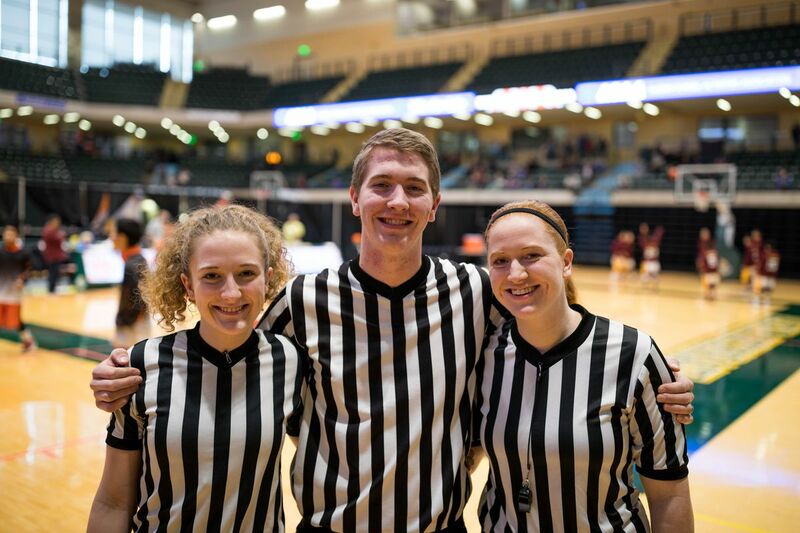 On Wednesday, three Dinkel siblings — Kyla, 24, Graham, 22, and McKenna, 20 — officiated two games together at the Class 1A basketball tournament at the Alaska Airlines Center. “It’s always been a dream of ours to (have) all three of us ref in a high school game,” Graham said. The three are among Mark and Leslie Dinkel’s seven children. They grew up playing basketball and they all they all got their start as referees while teenagers. “As soon as we were able to drive,” Kyla said. Their dad is the general manager at the MTA Sports Center, which is where they worked their first games. Kyla said the Valley is always in need of officials. She was more than willing to pick up a whistle when Dennis Boddy, the referee coordinator for the MTA Sports Center’s Valley Youth Basketball Program, asked if she was interested in officiating games. “I like to referee basketball because it was a big part of my life growing up,” she said. “It’s something I’m passionate about and love to do. Since I no longer play it’s a good way to stay involved in the game and to give back to the players too. Kyla said she and McKenna worked a couple of games together last year, and that McKenna and Graham have officiated one game together. “But this is the first time for the three of us,” she said. “… When the assignments came out, I said, oh my god, we have a game together! We are pumped." The trio worked Wednesday afternoon’s boys game between Akiak and Noorvik and also were scheduled to work an evening girls game between King Cove and Newtok. 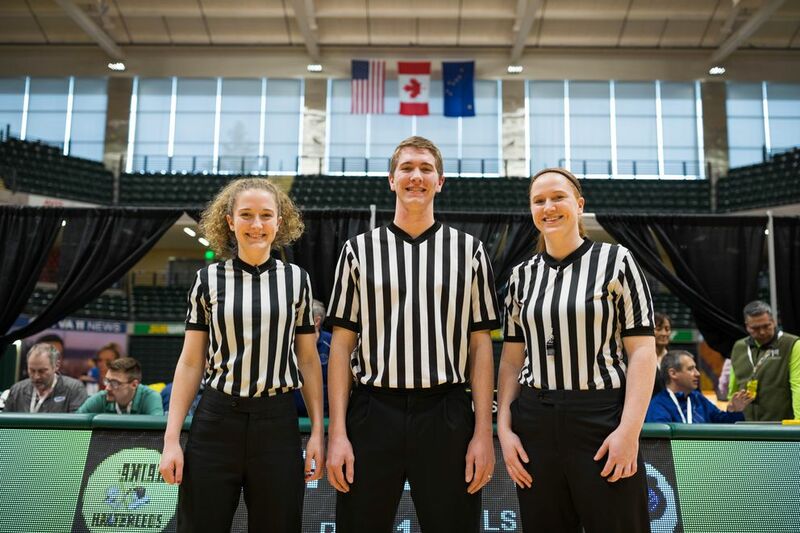 Kyla and Graham will also officiate games in the Class 2A state tournament, which begins Thursday at the Alaska Airlines Center. Carl Smith, the treasurer and game-assignor for the Anchorage Basketball Officials Association, said he thinks the Dinkels are making history at the state tournament, which uses three-person officiating crews..
“I’ve been at this for 30-plus years, and have known of a couple father/son duos, but not all three officials being in the same family, and siblings at that,” he said by email. All three were home-schooled, and all three have basketball bona fides. Kyla, who stands 6-foot-1, was a member of three state championships and was the 2013 Class 4A girls Player of the Year for the Wasilla Warriors. Graham, who is 6-5, played for Colony and was a first-team Northern Lights Conference pick in 2015. McKenna, at 5-9 the runt of the group, was on two of Wasilla’s state championship teams and was the conference MVP in 2017. Graham said he and his sisters frequently talk shop. Referees often discuss rules or situations after games, Kyla said, but she and her siblings have those conversations all the time.